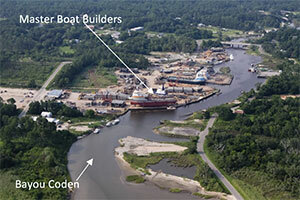 McFadden Engineering was retained by MBB to assist them with the development of a permit application and dredging plan to perform dredging activities in Bayou Coden and remove a portion of the adjacent upland area to widen the channel and thereby make it more navigable. McFadden Engineering developed a plan for the channel widening activities and development of an adjacent dredge material disposal site. Joint application and notification of proposed activities was submitted to the U.S. Army Corps of Engineers (Mobile District) and the Alabama Department of Environmental Management. Impacts of the project will be limited to sediment disturbance in Bayou Coden and a tidal marsh disturbance adjacent to the upland area. The sediment disturbance will be mitigated by implementing the proper best management practices (BMPs) at the dredge and disposal site. McFadden Engineering developed a BMP Plan that provided MBB and its contractors details for managing this sediment migration. MBB received the permit to perform the proposed activities in 2015 and MBB is currently working to implement the dredging plan. These activities, when completed, will provide the community and adjacent businesses (primarily shipyards) greater access to Porterville Bay and Mississippi Sound through Bayou Coden.